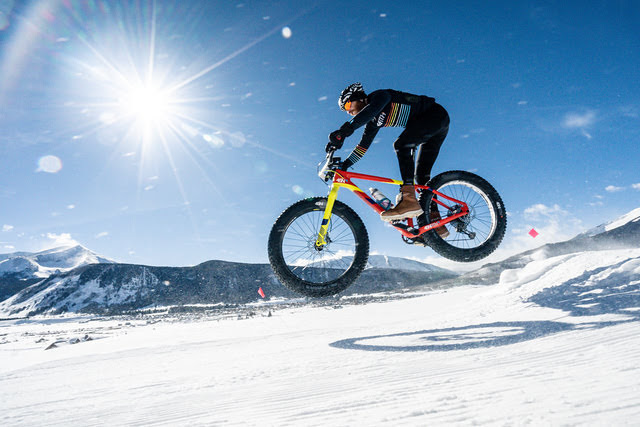 Last year the 45NRTH Team went to Fat Bike Worlds and I missed out. 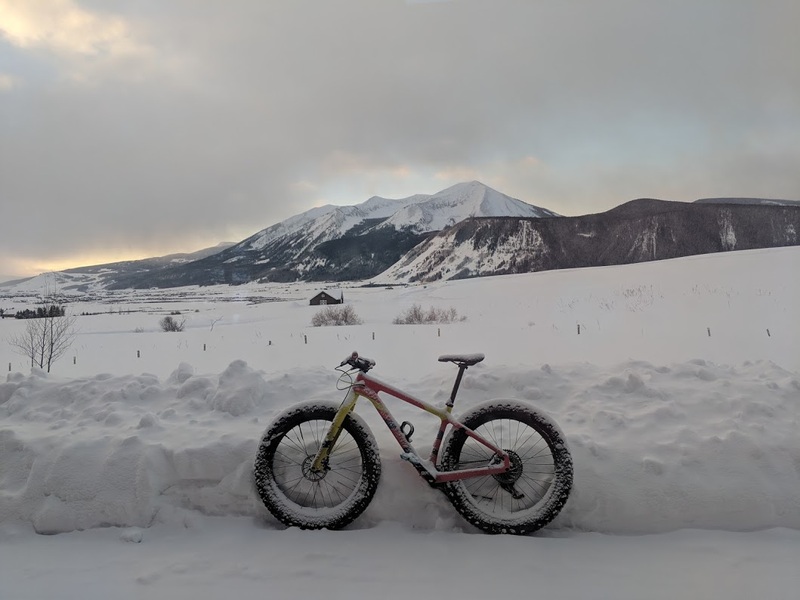 Not only had I never been to Crested Butte, but I wanted to ride my fat bike in the mountains!! This year I was determined to make it happen. I knew very little about the event itself but the spontaneity of the week was appealing, so plane tickets were purchased! 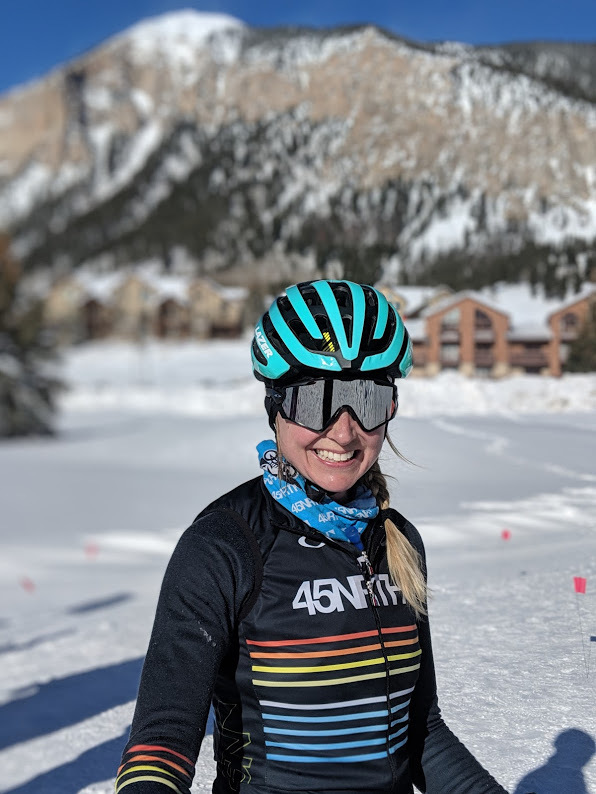 Since Crested Butte is 3- 4 hours from any main airport, I was grateful to catch a ride from Denver with Chelsea in the Beist (the trusty 45NRTH van). I’m not really into driving, especially in sketchy winter weather, so I was a happy co-pilot! 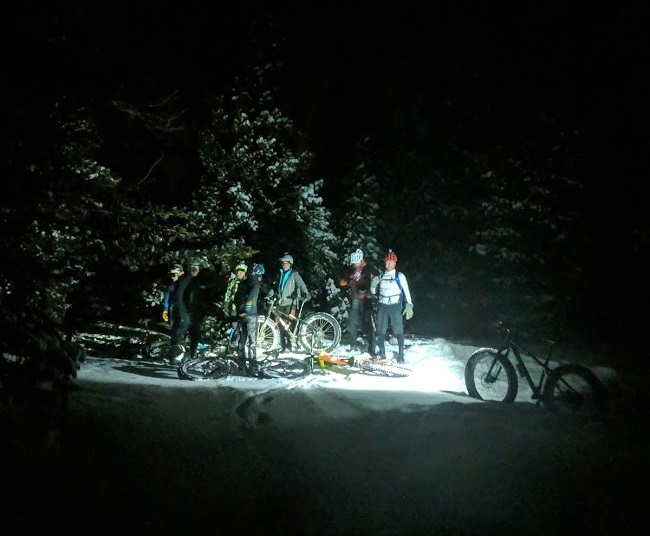 Our first stop was Red Stone in Lyons, CO for their weekly Tuesday Night Ride. I had no idea what I was getting myself into because I heard the route described as snow-duro. After a twisty drive to an area called Peaceful Valley, we were engulfed in huge pines and SO MUCH powdery snow. Dave and his crew were a riot and I was ecstatic to be tagging along, even with all the hike-a-bike! We climbed/walked/crawled for about three miles until we got to the turn around, where some whisky was shared. Here’s where the “snow-tech” kicked in… and we were given permission to ride like jack-a$$. Grab some rear brake and let ‘er rip! Needless to say, there were plenty of snow angels and hollering… I couldn’t stop laughing. All of our lollygagging got us back to the small town of Lyons a little later than expected. There was nothing for late night eats so we said our good byes and set out in search of a burrito and a hotel. Per Dave’s suggestion, we landed at a walk-up Mexican place called Taco Star. Since it was to-go only, Chelsea, Scott and I piled into the Beist and enjoyed the parking lot views. We found a hotel because our burrito bellies were ready for bed. We started the next day with hotel waffles, and headed out to get some work done before leaving the Front Range. We were suggested a spot called Otis, which had a delicious Nicaragua pour over and macarons. We camped out for a few hours and I was officially over caffeinated. It was at this point that I realized I was experiencing some affect of the altitude. I didn’t think much of it, but I literally had to pee every 30 minutes since I hit Denver, and now one cup of coffee had gone to my head. Hopefully I’d settle in, but I felt a little off. Ready or not, we were headed out to Crested Butte, higher elevation, and more mountains!! I knew the drive would be gorgeous but everywhere I looked there was a snowy peak poking out in the distance. 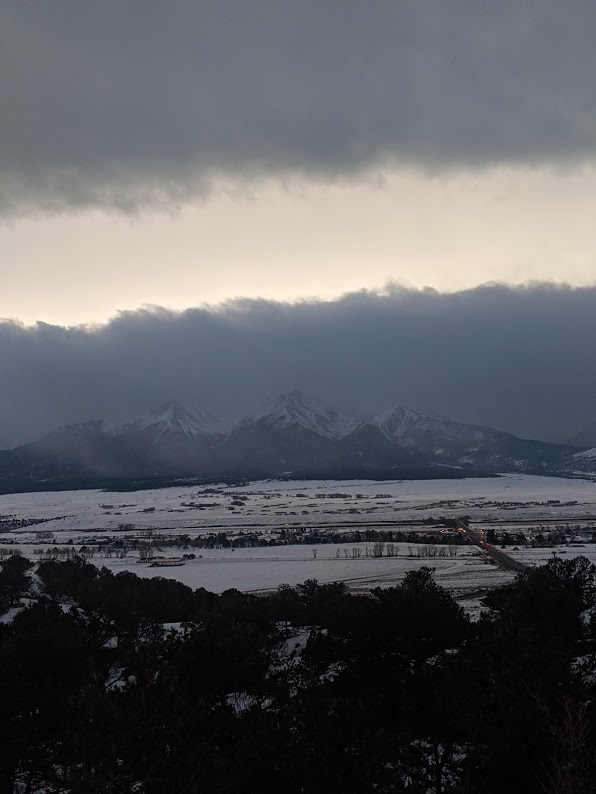 We stopped at the Collegiate Peaks overlook to take it all in. Chelsea was my champion for the week because of her composure and calm nerves when things got a little hairy… the snowy Monarch pass, in the dark, was no joke! We saw lots of cars in the ditch, and even saw an over-confident driver launch himself off highway right in front of the van. I continued my demanding pee schedule, which made for some interesting stops. Chelsea pressed on, even though I may have fallen asleep a few times. Luckily she was stocked with plenty of snacks and bubbly water. 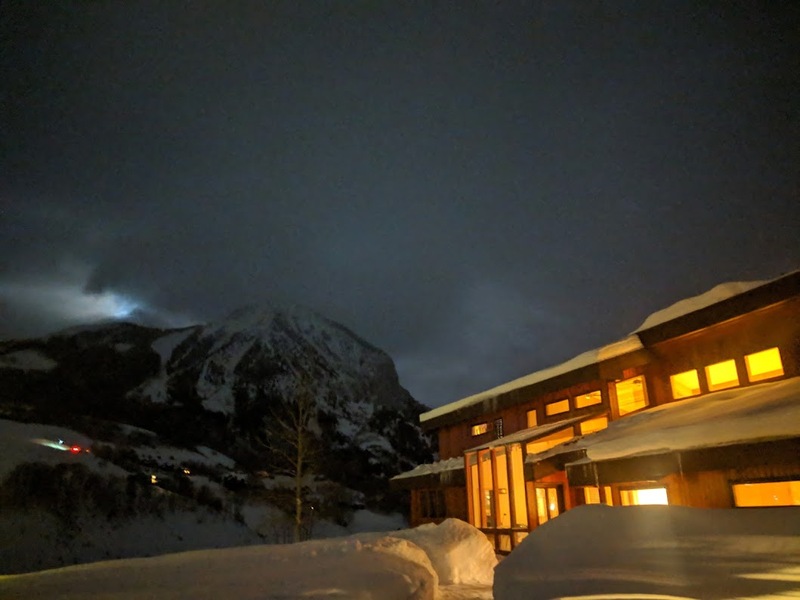 We made it to Crested Butte in the dark and met up with friends at Secret Stash. This was by far the most suggested place when I told people I was headed to Crested Butte. The pizza was eclectic and delicious… I’m a sucker for anything with an egg on it. We toasted to the eventful weekend to come and headed to the AirBnB. The house was so amazing and I felt like I was in a travel catalog. So many windows!! That night I woke up to weird breathing and so much pressure in my head. Welp, I guess this is my body reacting to being at 8,885 feet. I chugged a bunch of water and luckily fell back asleep. The next morning I woke up to views even more astonishing that I expected. I’ve never been past the Front Range so being in that bowl, lined with mountain peaks, felt really special. Most of us just sipped coffee and stared out the window. I was giddy to get out there and see more! Thursday’s festivities were focused on the North Village Classic, which is a Group or Solo circuit race. It was a groomed course in an open field, with lots of little rollers and sweeping turns. The 45NRTH crew had three Teams, and Matt rolling Solo. Scott and I, known as Team Taco Star, were in it for the smiles and fist pumps. We both had solids laps, but the course got really blown up with all the drifting snow and traffic. I appreciated the challenge, and it felt good pushing out a hard lap, and coming in to pass it off to Scott. Spirits were high and everyone involved was setting the tone. Plus, Jenny and Chelsea were dressed as Carebears so they were the most adorable team out there. 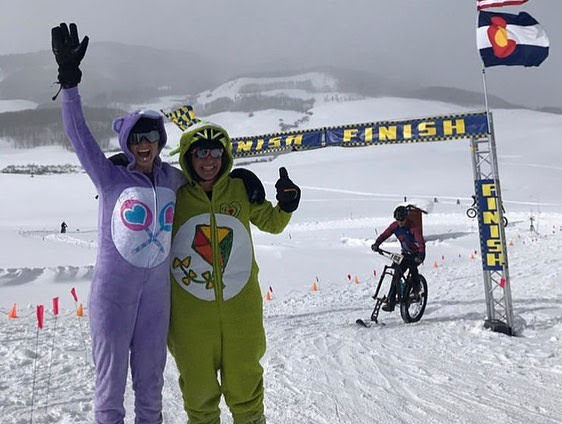 Some nicknames for 45NRTH Teamies were shared with the announcer that would stick throughout the weekend… looking at you ‘Bag Lady’, ‘Spicy Bear’, and ‘Caption Coconuts’. We won the day and even had some folks on the podium. Matt lapped everyone and had finished when most of our teams had 3 of 9 laps left! Low pressure, wide tires, and mad skills helped get through the course. 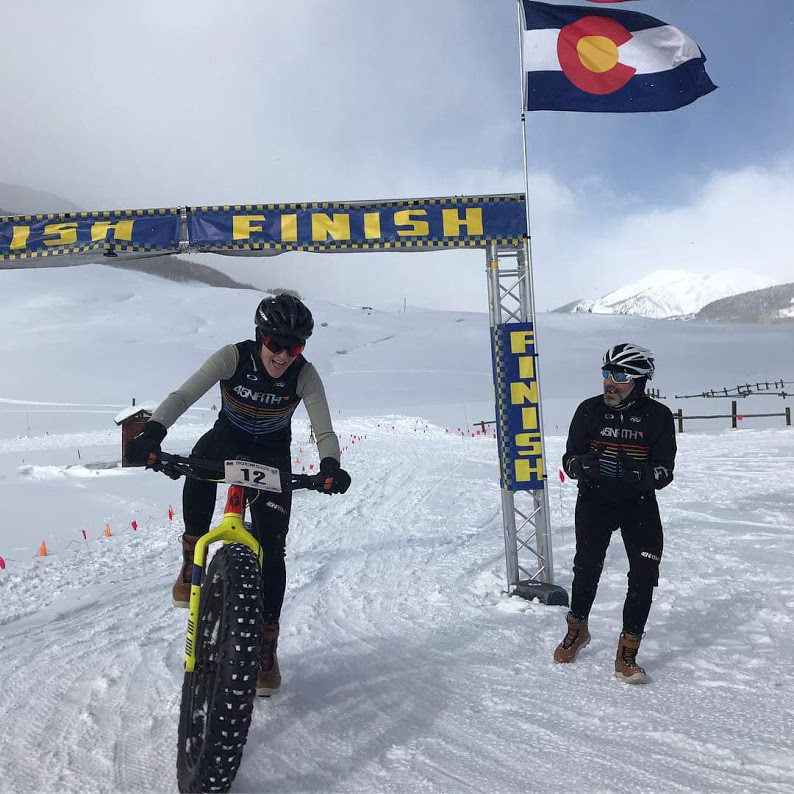 I was happy to be running 26” Wrathchilds, because the aggressive tread was helpful in the ruts and mashed potato conditions. I didn’t notice much fatigue during the race but I was ready to be horizontal soon after we got “home”. I was still catching up to the altitude because I shouldn’t have felt that worked. Thankfully, we spent the evening eating and recovering… I did lots of foam rolling and laying on the floor. My whole body ached especially my neck and head so I turned in early in hopes for extra rest. Friday was a demo day for participating shops and brands, so 45NRTH led a group ride. We had a good showing and headed up toward the town of Gothic. 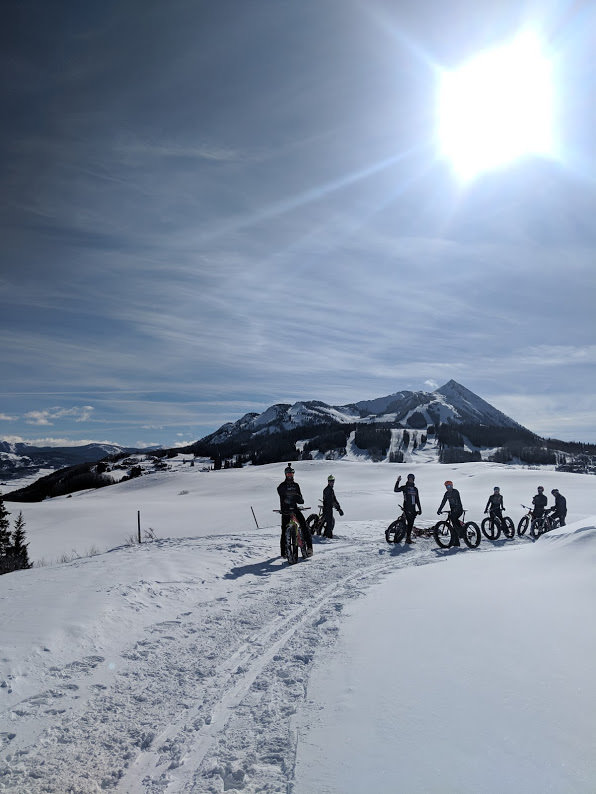 It’s a small research town just up from Mt Crested Butte, and the trail to it ribbons through tree lines and along a snowcapped mountain ridge. We shared the trail with other riders and snowshoers. The trail was well-trafficked but far from packed. It was a good day for practicing balancing and getting weird. 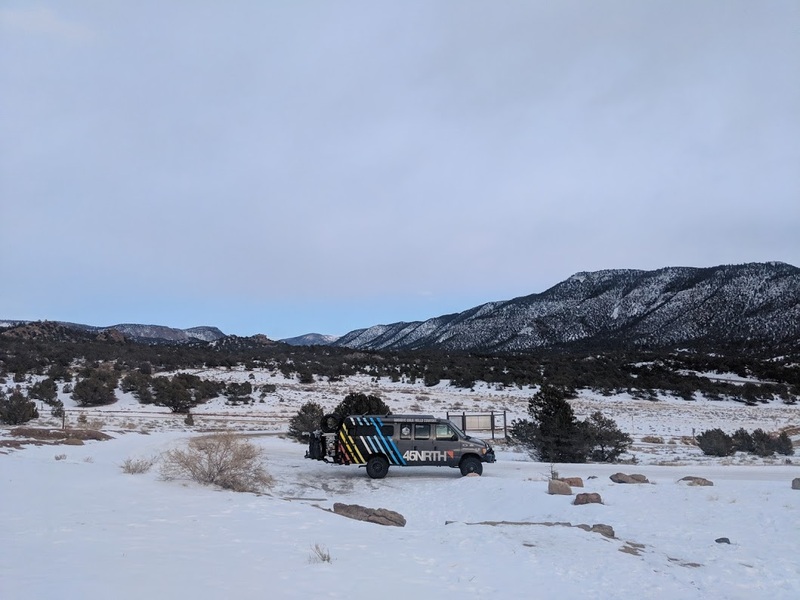 We made it to Gothic after a few hiking sections and snowdrifts. There wasn’t a cloud in the sky and that Colorado sun felt so darn warm! I was feeling better aside from sucking air when my heart rate was barely elevated. Elevation affects everyone differently, but each day it seemed to affect me more. The way back down to the demo area was equally beautiful. We had good 45NRTH train going! We still had to put some work in on the way down, but the bluebird day made it worth it. We woke up to single digits and a cloudless sky for the Championship race on Saturday. It was a 11am start so we had plenty of time for breakfast, over-thinking clothing choices, and downing coffee. I knew that Colorado sun would make the day feel 10+ degrees warmer than it would at home. I dressed conservatively with two wool layers and a vest. I stuck with my Wolvhammer boots, Sturmfist 5s and Naughtvind tights since the wind might be an issue. Since the course as different that the year prior, noone really knew what to expect. We got to the race a little late (due to that relaxing morning) so I didn’t get a chance to get on the course. From what I could tell it was firm and fast since they used heavy ski groomers! I ate some last minute snacks and collected a few last minute high fives. At the start line, basking in the sun, Tom and I kept saying how warm it was. We even looked and according to the internet, we would have zero wind. I didn’t adjust anything and just decided to roll with what I chose. It was a mass start and I started top 15. There were two women on the front row and I kept an eye on them as we got going. The moment we got out in the open I could feel that wind and tried to tuck in with the large group. I had a great start and was within a bike of the first two women. We hit the first hills and the group started to spread out. I’m a great climber but I was already breathing really heavy. I didn’t fall off the group but I was barely hanging on. The climb kicked up a bit more, and after passing some volunteers with whiskey, the group slowly pulled away from me. I didn’t give up but I wasn’t sure what I could sustain yet. I powered through the rest of the hill but the two women were easily 10 bike lengths ahead. I closed the gap a little on a slight downhill but my breathing still hadn’t settled in. I looked down to see my heartrate and I was shocked to see more of a tempo effort than a race effort, but my breathing didn’t match. My mouth tasted of iron and my throat was already raw. I backed off of bit because I know that pace wasn’t sustainable for me. My legs felt great but I wanted to finish, not hyperventilate! About half way through the lap, there’s a huge wall of a hill… I was in my 50T for most of the hill because the snow was already getting soft from ruts and racers running. Even some of the leaders were caught running. After I crested the last part of hill, I created a new goal for myself. If I do nothing else today, I will ride that wall of a hill, every lap. It’s the small things! After I fell off that chase group, I was alone for a long time. I’d catch some racers and some would catch me, be we never rode together. As we got to the last quarter of the lap I was happy have room to take any line I wanted! I rounded the last corner and headed into the 2-way section back towards the start finish. The tailwind was strong and I was feeling good! I could hear the announcer at the finish line and then I saw the first two women already heading out on their second lap. I was already a few minutes behind them. I just kept reminding myself to ride MY race and take it all it. When I remembered to look around I was almost laughing to myself about how gorgeous it was. I was just lucky to be there, giving it what I had! As I headed out on my second lap, the crowd was so fun and encouraging, I couldn’t help but smile and take in their energy. Remember that rad tailwind I just bragged about? Well, now we had a stiff headwind and I was pedaling on the descent back to the hills. Just as I dreamed of having a riding buddy, I heard a “hop on!” It was a Viking! 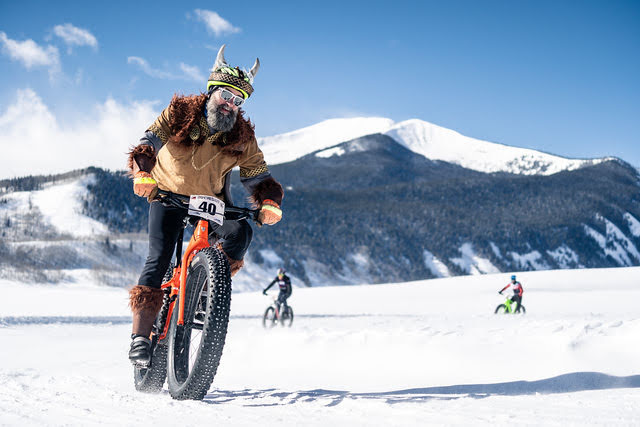 Well, it was a fat bike Viking and I didn’t even hesitate taking his wheel. He said we weren’t that far off the other women and he wanted to help me get up there. I was realistic and told him I wouldn’t be able to work that hard to stay with him. So again, I settled into my tempo heart rate, focused on deep breathing, but I was still on the verge of wheezing. I remembered to stay on top of eating and drinking because I didn’t need to bonk on top of it all! As I went out for my third lap, the wind had really picked up. I felt my pace slowing but I tried to stay steady and not let my mind wander. Ruts had started to form in the corners and there were now long sections of drifted snow. The course was getting more challenging as the race went on. I stopped at the aid station, grabbed a gel, and let some air out of my tires. I knew it would help in the drifts and the climbs where it was getting loose. I ended up catching my Viking friend. 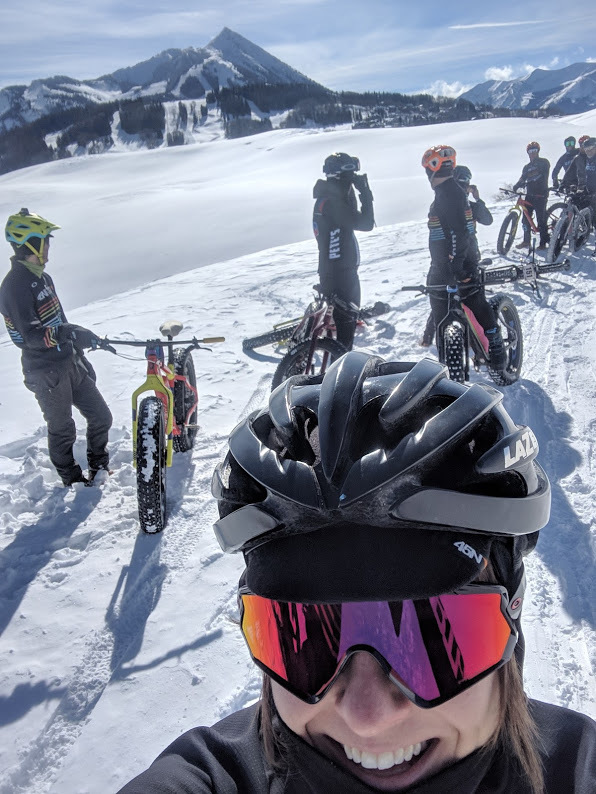 We exchanged a quick thought about steering with our belly button through the rutted turns… point with your belly button where you want to go and stay loose! Meanwhile, other racers were getting rad on the jump. I was silly and never tried it, but most of the 45NRTH Team found some air! I was on my last lap when I saw my Teammates, Matt and Evan, heading in to finish! They were so dang speedy! I still had most of the lap left and had to make it up that wall of hill one last time. I had only dabbed on lap 3 so far. I ate the rest of my food and tried to push it a bit more. At this point, my legs were starting to feel the burn of oxygen shortage that my lungs had felt all along. I made a few snow angels, scooted through some ruts, and gained a lot of enthusiasm from all the course volunteers. Those folks were true sports for being out there all day! I made it up the crazy hill and cheered other folks on during the 2-way sections. As I caught that tailwind on the way to the finish, I was pretty happy to be done! The announcer, Dave, who grooms and works the local Mountain Bike association, welcomed me in as the third female. I definitely appreciated his stoke throughout the weekend! I did it and all I wanted to do was sit down and BREATHE. That quickly turned into non-stop coughing. My body was so confused. After warming up, the coughing subsided and my stoke returned. I got to see Chelsea, Tom, and April finish and we all received our commemorative FB WORLDS Flask. We were all pooped… but heck, we just did this crazy race in the mountain, and it was hard! Our last night was spent sharing race stories and eating more Secret Stash pizza. I packed up for an early morning departure and soaked in all the views. I was sad to leave Crested Butte, but I was ready to sleep closer to sea level. The drive back to Denver did not disappoint. Monarch Pass was breathtaking and gave me the itch to get back up there and ride dirt this year. The drive made for the perfect, slow good-bye to the mountains. I always appreciate when events can be turned into a true race-cation, because most of the time exploring a new place is half the fun. I have more to see so I’ll make another trip to see the Rockies again soon!